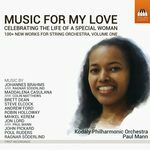 Music for my love : celebrating the life of a special woman / Kodály Philharmonic Orchestra, Paul Mann. Sleep : for string orchestra [eScore] / Andrew Ford. Sleep : for string orchestra / Andrew Ford. When Martin asked if I would compose something for string orchestra in memory of his beloved Yodit, I thought of making this song my starting point, partly for the cyclic nature of its harmonies (which could go round and round forever), but also because of David's words. The original a cappella setting presents the whole poem four times, the words coming more clearly into focus on each occasion. In turning it into a piece for string orchestra, I tried to preserve as much of the sound and sense of the missing words as possible in the articulation of the melodic lines. Commission note: Commissioned by Martin Anderson. 28 Oct 2017: at Steel City Strings (Wollongong Art Gallery). Featuring Steel City Strings, Luke Spicer. 22 Oct 2017: at Steel City Strings (The Pavilion Kiama). Featuring Steel City Strings, Luke Spicer.